I am an ER (emergency room) doctor by training and, strangely, really enjoy responding to disease outbreaks. The Ebola outbreak was something a bit different, but I felt compelled to go. I was so glad to be working with Medair, an organisation with which I could respond … if I could prove that we could feasibly do it. Following my leave, I started with the Global Emergency Response Team based out of Switzerland, and on my very first day of work, we sat down and had a meeting to discuss whether or not Medair would respond to the Ebola outbreak in West Africa. As we were new to Sierra Leone, I deployed as team leader and was responsible for overseeing our response. From a staff health perspective, I had to ensure that whatever protocols I set up would keep the team safe. I was also medical-in-charge and responsible for setting up the Ebola Treatment Centre, training the staff, and running it effectively—not only to treat patients, but also to ensure that suspected patients weren’t getting sick by being in there. Looking back, it was a really huge role and I was fortunate to have a great team. I was so incredibly thankful for the training we had all received beforehand from MSF and IFRC. It literally was life-saving! I learned a great deal about myself and more specifically what type of manager I am and how I lead teams. We were a really small team and everyone had a ton of work to do to set up the treatment centre. In situations like that, it’s easy to forget to do simple things like say ‘thank you’ or appreciate someone. I had someone specifically call me out on that, so it’s something I try to recognise and improve on now in my work. Yes, we’re all working hard, but it’s important to recognise that everyone is doing their part and still needs to be appreciated every now and again. Especially when you’re running around trying to get things going. 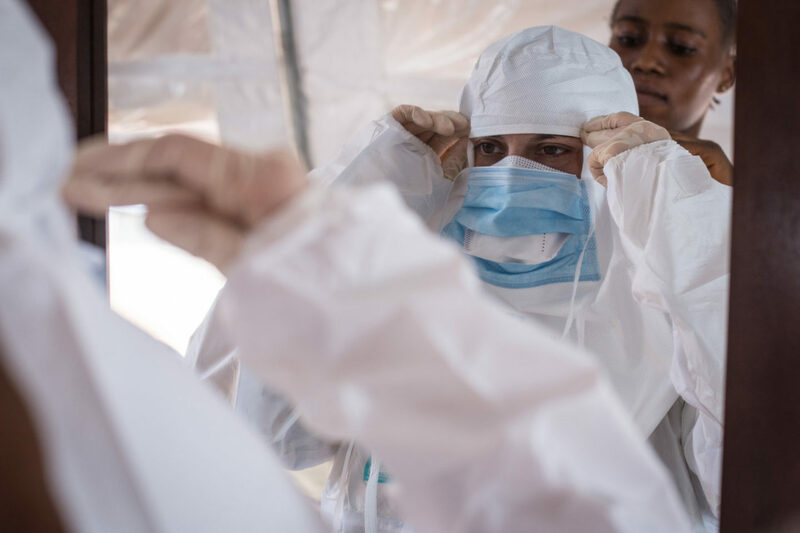 When the 10th recorded outbreak of Ebola in DR Congo was declared on 1 August 2018, I had already had the first phone call with our team there. The first confirmed cases emerged close to Beni town, where Medair has a base to support health and water, sanitation, and hygiene projects. As Medair teams were already on ground, my role was not to lead a start-up, but rather to provide technical support to the team in Beni. At the start, I was really worried. The team knew hardly anything about Ebola, or how to respond. Added to that, the visa process for DR Congo takes time: it prevented me from deploying immediately. I tried to provide recommendations and to train them from a distance, which is quite complicated. The stakes are so high, so it was scary to not physically be in Beni to see ‘are they implementing it in the way I’m picturing it in my mind? Am I communicating it effectively? What are the best ways to share these things?’ I’m very thankful for technology, and the fact that we had good internet on key days to be able to provide some training from a distance. I was so really happy to finally arrive two weeks after the outbreak had started and to see that the Beni team were busy doing great work. It was clear that the team had been able to apply the things they had learned through the trainings and to implement then very quickly. I was really impressed and excited to see how people had really stepped up to respond. When the outbreak is over, we’ll reflect and ask ‘was that done as well as it could have been? How could it have been done differently?’ Though the Beni team have done a fantastic job so far, it’s vital that we keep looking for ways to improve. Medair’s team in Beni is responding with the training and equipment they need to make a difference in this outbreak. New and experienced staff have come in to join the team on ground and so I felt confident to return to Switzerland to fulfil some pre-existing commitments there. I hoped to have the chance to rest, but emergency response work is unpredictable. Super-typhoon Mankhut hit the Philippines last Friday, causing widespread damage. Three of my Emergency Response Team colleagues have already flown out to assess how best to respond, and I’ll support the response through coordination from Switzerland to ensure that we have adequate funding and personnel. This highlights the need to flexible, continuing to play different roles in responding to needs across the world, however and whenever they present themselves.